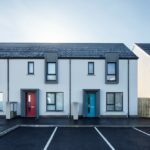 Appointed by Clanmil Housing Association, FORRME has constructed 32 social housing units, made up of a mix of new-build houses, apartments and complex needs bungalows. The development has been designed to bring together clever space optimisation, while retaining a sense of space and community with surrounding landscape design and multi-use green spaces. Commenting on the project, FORRME’s MD, Mark Currie said, “We are especially proud of the Dromore Street Housing Development which has been constructed to Lifetime Homes standard meaning it is a long-term housing solution that will support the local community for decades to come. FORRME celebrated its 40th anniversary and rebranded from Donaghmore Construction in January 2018. The company’s turnover has increased five-fold since 2014. Staff numbers have risen from 13 to 55.